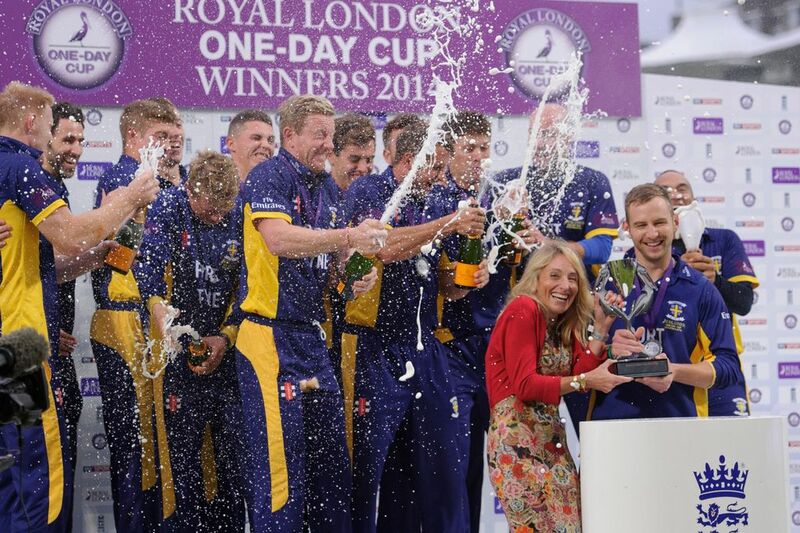 Durham need just 166 to win the inaugural Royal London Cup. A brilliant bowling display saw Warwickshire dismissed for just 165 this afternoon. With the floodlights on throughout the innings because of the murky overhead conditions, the toss was always going to be crucial on a pitch with plenty of green in it. But the whole bowling unit did brilliantly to back up Mark Stoneman's decision. Will Porterfield edged his first delivery just in front of the slip cordon, and Paul Coughlin thought he had Varun Chopra caught for one off an inside edge. Rushworth's first wicket came courtesy of a good low catch by Phil Mustard to get rid of Will Porterfield. But the crucial wicket came when Paul Collingwood was brought into the attack, at the end of the mandatory powerplay. Collingwood struck with his third delivery, Jonathan Trott lbw playing across the line. When Chopra leaned into a ball from Rushworth in the 13th over he scored Warwickshire's second boundary of the match, and their first for 63 deliveries. The situation could have been even worse for Warwickshire, Collingwood and Mustard both putting down catches players of their quality ought to have snaffled. Collingwood took his second wicket when Tim Ambrose slashed at the ball and Gareth Breese, wide at slip, took a good catch to his right. It was the first of four wickets for five runs as Warwickshire slumped to 68-5. When Ben Stokes dug a ball in at Laurie Evans he played across it and gloved a catch to Breese, making his final limited-overs appearance for Durham. Dropped by Mustard, Rikki Clarke played all around a full ball from Stokes and was bowled for nought. Amid the carnage, captain Chopra reached his 50 from 95 deliveries with three fours. In Chris Woakes he at last found some much-needed support. The England all-rounder hit the ball nicely down the ground, and Keaton Jennings' only over cost nine runs as he tried to counter-attack, only for a fantastic Calum MacLeod catch to end the partnership when it was worth 47. Running back at mid-on, MacLeod got his feet in the wrong place as he back-pedalled trying to pick up the flight of the ball but adjusted brilliantly to take the ball above his head. When Chopra followed, bowled around his legs from the third ball of Rushworth's second spell the game was all but up for Warwickshire. That came during the batting powerplay, when Warwickshire scored just ten runs in the five overs for the loss of Chopra. Breese finished with 3-30, removing Jeetan Patel after the New Zealander had hit him for the first of only two sixes in the innings. The innings finished three overs early in suitably shambolic fashion, Scott Borthwick running out Boyd Rankin after the big Irishman was sent back by Ateeq Javed.